How To :: Read Naturally Encore: Planning and setting up :: Read Naturally, Inc.
Before you implement Read Naturally Encore, you should create an effective learning environment for your students. Organize your schedule, setting, and materials in a way that maximizes efficiency and ensures that students spend as much time as possible reading. You should schedule Encore sessions at least three to five times per week in blocks of 30 minutes or more. Students who participate in five sessions per week are likely to make the greatest improvements. One direct way to increase the amount of time students spend reading is to schedule more sessions. The more reading your students do, the more quickly they will improve. Encore is best implemented with a maximum of six students per teacher. Educational assistants, parents, or other adult volunteers can be trained to help under the direction of a teacher. Resource Room or Reading Lab Students who need reading intervention come to a resource room or reading lab. The teacher sets up the Encore materials permanently, or he or she sets them up each time students come to class. Classroom The classroom teacher sets up an Encore station in the classroom. During small group instruction or independent work time, a few students improve their fluency by working at the Encore station with a teacher, educational assistant, or volunteer. Cart A collaborative support teacher brings the materials for an Encore station into a classroom on a cart. Students help set up the reading station using materials from the cart and help put the materials back after each class. The collaborative support teacher then takes the cart to the next classroom on the schedule. Before or After School Under the direction of a teacher, an Encore class can be offered before or after school. The staff, community educators, parents, or other volunteers can set up the reading station prior to class and put the materials away after each class. Each blackline masters book contains 24 high-interest, nonfiction stories at a specific reading level. Create a master set of all of the stories/comprehension questions for each level, and organize them into two sets: odd-numbered stories (Set 1) and even-numbered stories (Set 2). Use these master sets to make copies for student folders. Since each audio CD has the audio for one odd-numbered story and one even-numbered story, this enables more students to use the same audio CDs. Read Naturally recommends giving a student Set 1 first. After the student completes Set 1, give him or her Set 2. Each level includes 12 audio CDs. Each CD contains the audio tracks for two stories. For each story, the CD includes audio support for the key words, three audio recordings of the story at different rates (including one at an expressive rate), and audio support for the vocabulary words in the glossary. Each story in Encore Sequenced levels 1.0 through 4.5 also includes a track with an optional audio recording of a Spanish translation of the story to support students whose first language is Spanish. Each level includes a full-color, audio-supported glossary. (Additional glossaries can be purchased or downloaded; see Additional Glossaries below.) The glossary helps students learn the meanings of challenging words, which are bold-faced in the stories. Many definitions include full-color pictures and sample sentences. The audio CD for each story includes recordings of the words and definitions. Answer keys are located in the back of each blackline masters book. Make copies available to students in a central location (if students will be correcting their own comprehension questions), or store copies for use by teachers and assistants. You can color-code the answer keys to match the colors of the levels and laminate the copies to make them last longer. To help students remember the sequence of steps, hang a large-format Read Naturally Steps poster in a central location, or give each student a letter-size copy of the poster. (Read Naturally folders have the poster printed on the back.) A Class Step Tracker form is also available to help students keep track of which step they are working on. The Certificate of Achievement keeps parents involved in the learning process. After a student passes several stories in a level, staple the stories together with a Certificate of Achievement award as a cover letter. The student can take the booklet of stories home, read and discuss the stories with a parent/guardian, and return the tear-off portion of the award signed by a parent/guardian. Each student needs a timer to complete the Read Naturally steps. Read Naturally timers are digital but do not display the countdown of the seconds, because a visual countdown tempts a student to take his or her eyes off the page to check the time. Number your timers with a permanent marker, and instruct each student to use only his or her assigned timer. 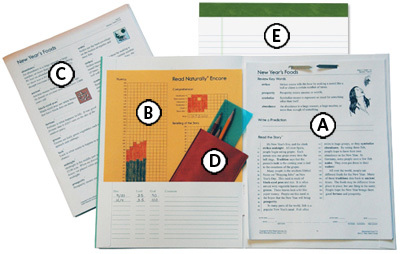 A folder holds copies of a student's stories, graphs, and glossary pages. Students may also keep red/blue pencils, red/green pouches, and reading guides in their folders. See Preparing Folders below. Each student needs to have access to an audio CD player and be able to work on this equipment alone. Ideally, each student should have his or her own CD player to use. However, CD players can be shared by setting up a listening table where students sit only while doing the audio steps. A student can also share equipment by picking up a CD player from a central location for the audio steps and returning it when finished. Headphones allow students to hear the audio recordings clearly without distracting others. Students can also use headphones while practicing independently to reduce the sounds of the other students reading. Students use colored pencils to mark their cold- and hot-timing scores on the graphs. Using blue for the cold timing and red for the hot timing helps the student and teacher quickly identify the amount of progress the student has made. The story pages for levels 5.6 and above do not provide space for writing a prediction or for summarizing the story. To complete these steps, a student working in level 5.6 or above will need paper or a notebook in his or her folder. A reading guide is a clear piece of plastic with straight edges that helps a student track words across a line of text. Read Naturally's reading guides are made of sturdy, blue-tinted plastic to reduce glare. You will need additional glossaries (one for each student) when several students are working in the same Sequenced or Phonics level at the same time. Prepare an activity that students can work on independently while waiting for the teacher. One option is providing the free crossword puzzles that are available for the Sequenced and Phonics series (one for each story). These crosswords give students an opportunity to use the vocabulary words that are bold-faced in the stories and defined in the glossaries. See the Encore Teacher's Manual for more ideas. Read Naturally folders are available in five colors. You can organize your student groups by color for easy management of materials. The folders include lines for tracking level and goal adjustments and recording comments (printed discreetly on the inside pockets of the folders). Each folder has the steps of the Read Naturally strategy listed on the back. Stories/Comprehension Questions: Each folder should have the set of 12 odd-numbered stories (and corresponding questions) or the set of 12 even-numbered stories (and corresponding questions) from the student's level. Attach the story/question pages to the right side of the folder. Read Naturally folders include self-adhesive, pronged fasteners so that you can easily attach the stories. Hole-punch the stories at the top; otherwise, the word count numbers on the side may be cut off. Graphs: Put the graphs in the left folder pocket, or attach the graphs to the folder under the stories. If you place the graphs under the stories, copy the graphs on colored paper for easy identification. Glossary: If you have enough glossaries (glossary books or printed pages), place a glossary for the student's level in the folder. Otherwise, place glossaries in a central location. Red/Green Pouch, Pencils, and Reading Guide: Place the student's pencil, red/blue pencil, and reading guide in the red/green pouch. Then place the pouch in the folder pocket. Paper or Notebook (Levels 5.6 and Above): Place paper or a notebook in the folder for each student working in levels 5.6 and above, because these levels do not provide space for writing story predictions or summaries.